EDAP TMS SA (Nasdaq: EDAP) ("the Company"), the global leader in therapeutic ultrasound, today announced that it has received 510(k) clearance from the US Food and Drug Administration (FDA) for its Focal One device for the ablation of prostate tissue. The Focal One high intensity focused ultrasound (HIFU) device is the first medical apparatus designed specifically for focal treatment of the prostate. Focal One fuses MR and 3D biopsy data with real-time ultrasound imaging, which allows urologists to view integrated, detailed 3D images of the prostate on a large monitor and direct high intensity ultrasound waves to ablate the targeted area. With Focal One, urology surgeons can establish precise contours around the diseased tissue and ablate an even smaller portion of the prostate. This lessens the damage to healthy tissue, and minimizes side effects of incontinence and impotence for patients. Using Focal One, surgeons can customize the HIFU procedure for each patient and each clinical condition. "Focal One is a great step forward in using this new and important ultrasound technology for prostate tissue ablation," said Dr. Brian Miles, Urologist, Professor of Urology, Houston Methodist Hospital - Weill Cornell Medical College. "Focal One's ability to merge MRI images, ultrasound images and biopsy data in order to precisely outline and treat just the diseased tissue area of the prostate is truly remarkable." "We are thrilled that this innovative technology will now be available to patients and physicians in the United States," said Marc Oczachowski, Chief Executive Officer of EDAP. "The FDA's clearance of Focal One validates not only the power of our technology but also the years of hard work and dedication by our clinical trial investigators and EDAP's outstanding employees. 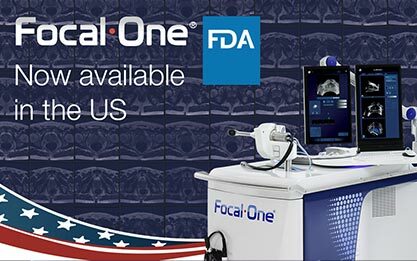 Focal One's real-time imaging and 3D robotic features allow for greater precision, leading to improved targeting and treatment planning, and we are excited to be able to expand access to Focal One to the most important healthcare market in the world."